I read the Grassroute Guide and found it filled with valuable tools for keeping our organization on the right track. How to create a nurturing grassroots environment in which each participant can grow to his or her full potential. How to encourage and foster sharing, mutual support, collective enrichment, and a trust in abundance. How to foster a free and transparent flow of information, consciously and gracefully, among all individuals and all parts of the organization. How to vest authority, exercise power, and commit resources in the smallest or most localized units of your grassroots group and still include all relevant and affected parties. How to generate healthy inter-dependence, cooperation, collaboration and respectful interactions among facilitators, volunteers and the grassroots community. How to avoid creating intrinsic advantages or disadvantages for any individual or portion of your grassroots group. How to maintain the highest standards of personal and professional integrity, accountability, and performance. How to recognize and honor wisdom, expertise, and all thoughts and actions grounded in higher consciousness and selfless service. How to promote development and growth of the grassroots community, and work to assure the integrity and coherence of the whole. How to structure decision making processes that meaningfully involve those who are directly relevant... Click here to read the full description! How to learn at the speed of light using a natural learning process called Mental Photography that allows you to take in information at over 100 times faster than the average reading speed - to be exact, that is 25,000+ WPM... and faster! Discover how shockingly simple it is to facilitate renewed health and wellness of your mind and body, simply by telling your mind to do it for you. On Main Street and the Internet! OK, so you have read the marketing books about how to get traffic to your site and you've used some or all of what you've learnt. But what happens when they visit your site. Maybe they go on your mailing list, if you have one, maybe they buy or maybe they do nothing at all and never return. Industry statistics indicate the average web site converts a maximum of 1% of visitors to customers. That's not many when you consider how much work you have to do to get them to your site. The e-commerce industry is awash with new services and hype about eCRM and vCRM. IDC Worldwide estimated that by 2003, US$90 billion would be spent on CRM initiatives for the very purpose of increasing visitor to customer ratio's. "Here is the Secret to Maximizing Your Productivity and Working Less!" Do you find that there are not enough hours in the day to do what you need to do? Do you find that time just flies by and before you know it, you haven't achieved hardly anything at all? Do you have a problem with time management? If you answered yes to any of these questions then you have two main options. One of those options and often the most popular is to continue on with your normal activities. Unfortunately, doing so may have a negative impact on your personal life as well as your work life. The other option is to make a change. The good news is that there are a number of steps that you can take to improve your time management. Introducing the Proven System of Time Management! "Finding More Time" can allow you to get more done in the least amount of time, giving you even more time to spend with your family and friends. 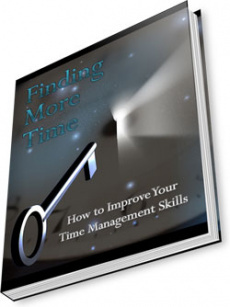 Learn how to manage your time more effectively with "Finding More Time"! ....learn how to manage your staff so they perform at a higher level and help you build a more successful business. How to be clear about what you expect from them....an employee always wants to know how to best perform. How to coach an employee to higher performance....employees want your leadership and will follow a strong manager. How to give your employees the opportunities to perform......if they can't or won't, then how to let them go. This great ebook provides 13 basic self-study courses on essential management and supervisory skills topics. These courses have been combined into one very cost effective package. It does not matter if you are new to the world of management and supervision or you have been managing others for years. You will find something of value which will help you improve your capabilities. Take a moment to review the topics we cover. All of the courses in these books range from 30 minutes to to 2 hours to complete and are presented in an easy to read, straight-forward fashion. your own personal action plan for how you will implement what you have learned. "The 7 Secrets to Highly Profitable Internal Control Systems" gives you step-by-step information about how you can implement the whole system while using minimal resources. The ebook contains loads of hands-on material, like checklists for all significant processes.